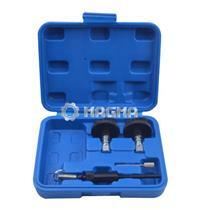 Suitable for setting the camshaft and crankshaft, on Vauxhall/Opel and Suzuki chain drive 1.3 diesel engines. When an automotive timing belt is replaced, care must be taken to ensure that the valve and piston movements are correctly synchronized. Failure to synchronize correctly can lead to problems with valve timing, and this in turn, in extremes, can cause collision between valves and pistons ininterference engines. This is not a problem unique to timing belts since the same issue exists with all other cam/crank timing methods such as gears or chains. To help alleviate a timing belt from being incorrectly installed, the timing belt has painted marks on the surface of the belt that line up with markings on the camshaft gears and crankshaft gear so that the belt is perfectly aligned and properly positioned.